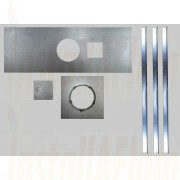 Register plates or debris plates are used to seal off the open chimney chamber, these plates are used with or without a flexible flue liner, to seal off the open flue to prevent chimney debris falling into the room. 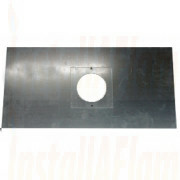 Our stove register plates are supplied with supporting brackets ready for installation in your chimney. Manufactured from galvanised steel, we stock various sized stove register plates with sweeping hatches and collars, some plates are available with adjustable center to suit your installation.